Bangalore-based CareerStack Innovation Pvt Ltd-owned HackerEarth was started as an initiative to help bridge the gap between developers and employment opportunities. The aim was to connect software companies with quality developers based on actual coding tests. Founded in November 2012, HackerEarth is the brainchild of IIT Roorkee alumni Sachin Gupta and Vivek Prakash. While Gupta worked at Google prior to starting HackerEarth, Prakash was a student developer at Google Summer of Code and Amazon. In addition, before starting HackerEarth, the duo teamed up (during college days) to form MyCareerStack, a learning/discussion portal where people could discuss programming questions, write codes and prepare for technical interviews. "The platform was very well received and in the first month itself we had around 2 lakh page views," said Gupta, co-founder and CEO, HackerEarth. How did HackerEarth come along? While working on MyCareerStack, the founders had interacted with many entrepreneurs from startups like WebEngage, InMobi, Capillary Technologies, Canvera, etc. During these interactions, all entrepreneurs pointed out that there was a dearth of good developers and programmers. "Some CEOs even said that they spend as much as 40 per cent of their time in finding the right talent," Gupta said. According to some companies, only 5 out of 100 resumes are actually worth interviewing, he added. "This was shocking to us, because we always believed there was a shortage of good jobs, but we realised that companies felt there was a shortage of good talent," Gupta said. This forced them to enquire if there was really a shortage of talent and they found that there is a disconnect between good developers and worthy opportunities. "A lot of good developers are scattered across the country, but they are not aware of the opportunities at newer companies. They only know about Infosys and Wipro or about tech giants like Google and Microsoft," Gupta said. The startup has three products or follows a three-pronged business model. The first is HackerEarth Source, which helps companies source candidates through hiring challenges. For this product, which currently has 15 customers, the startup charges companies on a per-hire basis. Though the commission per hire made through this product depends on factors like job profile, qualifications of the candidate, package, etc., the firm charges Rs 40,000-80,000 per hire, Gupta said. 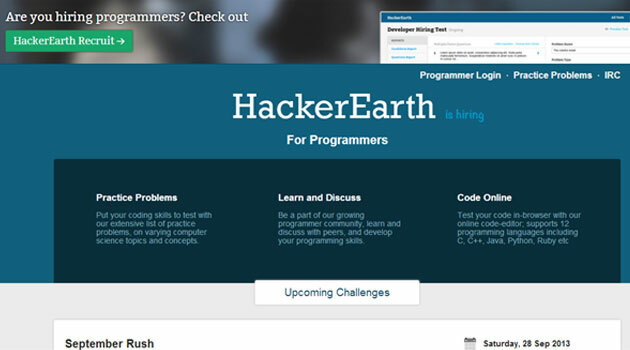 The second product is HackerEarth Recruit. A SaaS-based application and a B2B product, it is used by companies to screen potential candidates. It works on a prepay model wherein the companies have to purchase invites to enable candidates to take up the test. This product has around 20 takers currently and costs Rs 125 per invite. The third product is HackerEarth Campus, a SaaS application to conduct campus placement and filter potential candidates. For this product, companies are charged based on the number of students appearing for the placement. The cost depends on the volume; the minimum amount charged per test is Rs 100. Though Gupta refrained from sharing numbers, he said the firm is breaking even with the help of a lean team—currently the team comprises only five members, including the founders—and by keeping operational costs low. The startups is powering campus placements for Hindustan Times, Pearson, Innoz, etc., while its other clients include companies like InMobi, Capillary Technologies, CareerNet, IndiaMart, Freshdesk, CommonFloor and LiveText. The startup was part of the inaugural batch of GSF Accelerator along with 14 other companies and recently raised $1,50000 from GSF Superangels as a follow-up seed round. "The funds are used for hosting and operational costs, salaries and marketing," Gupta said. He shared that the startup is looking at expanding team wise as well as geographically after raising funds. The firm is looking to bring in two more people soon. On the geographical front, it is planning to make a foothold in the US. Though the startup has a niche and focused audience, it competes with many players. Apart from firms like Naukri.com and Monster.com, it has to fight for customer attention with other niche players like InterviewStreet, Mettl and Smarterer.